Oil Shock Horror Probe: When might New Zealand's oil imports dry up? But since I have a strong desire to make sure that when ‘it’ happens to me I am as prepared for the ‘transition’ as I can be, I have prepared this analysis based on the best contemporary information I can find. Raw data on country-by country production and consumption is usefully complied by the CIA. Subtracting one from the other gives the country’s import/export status. The available CIA data is generally of about 2009 vintage – good enough for overall views. The following Table 1 shows by country the Top Ten world ranking for oil production and consumption and hence (by subtraction) exporter and importer ranking too. Outside the club containing all the net oil exporters and the top ten importers is a group of comparatively impotent countries with little or no indigenous oil production who all rely on imports to satisfy their demands. For example New Zealand produces about 61,000 barrels per day and consumes about 151,000 barrels per day (CIA 2009 data). Virtually all New Zealand’s production goes to refineries offshore, so we import most of our domestic needs in spite of our fluctuating oil production approaching 40% of our volumetric demand. The estimates of the scale of our currently producing oil reserves have been downgraded recently, and production is now confirmed to be falling sharply. 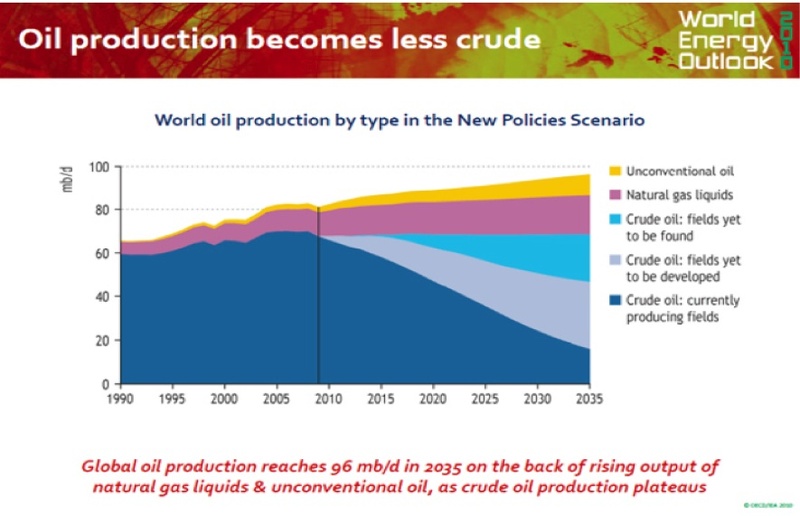 The P50 estimates of actual oil production for the significant oil-producing fields around New Zealand each fall to the near-useless volume of 1 million barrels per year (about 2750 barrels per day) between 2020 and 2025. So even if we were to divert local production to our refinery (and then pay the going global price for it) it will only be a drop in our present daily demand bucket of 160,000 barrels. Barely enough to sustain essential emergency and security services, but maybe worth having all the same. So what is the likelihood of increasing growth in production from the biggest producers? Saudi Arabia is unlikely to increase production much beyond present levels. After several years of steady increases, it appears that Russia’s oil companies are struggling to increase production due in part to the ongoing depletion of existing oil fields. IEA data confirms that production from the United States is at best steady, bolstered only by shale oil and imports from Canada and further abroad. Iran, in spite of hopes to the contrary, appears to be in decline too, and unless its political woes are resolved that is unlikely to change. And so we go on down the list, with scant encouraging news to be found on the increasing production front. Now our dragon is eating its tail - all oil exporters are also oil consumers. It is inevitable that the local oil production of these countries will eventually be crossed by the internal oil demands of the country – if only because the country sells its oil very cheaply to its population to maintain social order and its political power base. As Luis de Sousa noted in his presentation to ASPO in Portugal in 2008, Jeffry Brown’s Export Land Model for any country sees production and consumption run relentlessly towards each other. There are a number of well-documented recent cases of this effect, notably Indonesia, Egypt, Malaysia and recently Vietnam. The risk of Mexico crossing the zero export line is as acute as it is unavoidable due not only to the effects on the people of Mexico but on the USA’s supply situation too. Saudi Arabia’s internal oil consumption is increasing at about 6% per year and will equal its oil production around 2030. Even Russia is expected to be consuming all its production by around 2025. Analysis of the top exporters show a persistent trend down to zero exports. Not a good look. The USA obviously suffers intensely with its history of oil deals with increasingly shaky and unsympathetic regimes, with its final solution to any particularly difficult provider being to give other nations the idea that the use or threat of military force is a legitimate way to secure oil supplies. The USA’s demand is stalled for now. The remainder of the top ten importers tend to adopt rather more conventional and successful approaches. Japan’s oil deal with Iran may no longer be current, and it appears to be a bit behind the others in nailing secure supplies. Its state of mind right now with the demise of public favour of nuclear and the resulting economic impacts leaves it unlikely that Japan’s demand will increase markedly, although its economic clout means its basic fuel supply needs will still need to be met. And the deal-making is never simple, with Germany recently providing bank assistance to India to help that country with an oil deal with Iran, over protests from US of A. The deal ostensibly led to the release of two German reporters held by Iran, but nevertheless the use of oil agreements as a bargaining chip is an interesting development. South Korea is rubbing shoulders with suppliers in South Africa, United Arab Emirates (for a 100 years!) as well as agreements with the big corporates Shell and Total. India is striking up useful relations with the House of Saud and Kazakhstan, and no doubt as many others as it can, and who can blame them. It’s a great example of what a state with awareness of the coming crisis should be doing. A Lamb for Litres deal between New Zealand and any anybody who eats meat and produces oil would not be a bad scheme. The odd refrigerated container as a back load on the deck of a tanker would not be a bad idea. India’s demand is expected to grow by up to 8% next year. And even France has not been backward at coming forward – rapidly establishing working relations with the new regime in Libya. With the present oil supply structure the New Zealand government has no intrinsic structure or mandate with which to commence such negotiations. Thus compared to the Top Ten Importers, New Zealand is singularly timid in any effort to establish working relationships with other sovereign-state providers, preferring instead to rely entirely on multi-national corporate providers to satisfy its domestic needs. New Zealand Refining Company’s major shareholders are BP, Exxon Mobil, Aotea Energy Limited (‘Z’ to the man on the street), Garlow Management Incorporated and Chevron. Garlow seems to be withdrawing from a number of NZ investments, including putting its stake in Rainbow’s End up for sale, but I suspect its interest in Marsden Point may be more in that facility’s ability to process the heavier sour Arabian crudes and on-ship them to more lucrative destinations in the continental United States and to its home ports in Canada than to provide any benefit here. Only the independent brand Gull (wholly owned by Gull Group from Australia) imports its refined product directly to its terminal in Tauranga. So in total New Zealand’s fuel supply arrangements of around 160,000 barrels a day are directly ‘owned’ by private interests, and the New Zealand government does not have any effective international agreement for supply of fuel at all; with anybody. We certainly do not have anything like the astonishing 100-year agreements secured by the likes of South Korea – that is foresight with a capital ‘F’. We have the net oil exporters who are enjoying the economic and social benefits of their happy positions, with the inevitable outcome (as highlighted by the Export Land Model) that their ability to export is rapidly eroding; next we have the Top Ten importers who are employing every possible shade of negotiation skill, guile and if necessary force to secure robust and remarkably long term supply agreements with those oil exporters, and we have the likes of New Zealand with no effective direct hold at all on its oil supply. The exporting nations are of course in a prime spot as far as future global economic activity is concerned. If you are setting up a new production line will you do it in an increasingly energy poor country like New Zealand (about as energy-poor as it gets) or even one like Mexico which is close to oil-neutrality and the consequent collapse of its major income stream and Egypt-type social instability soon thereafter? No, you will pick a winner and look for the most politically-stable operating base you can find. Norway, for example, looks a good pick, and Russia too for a while if you can figure out the rules to operate there. The point is that thoughtful manufacturers will transfer operations to countries that have the best chance of being productive longest, while abandoning less well-endowed and hence riskier locations. This will of course exacerbate the failure of the energy-poor economies, and hasten the rise in internal energy consumption by the current net exporters. There is little comfort to be gained from the fact that we are probably not alone in this unhappy condition. If we count the oil exporters on the CIA list we find that there are some 43 countries with a production surplus ranging from as little as one thousand barrels a day up to Russia with 7,800,000 barrels a day to sell. The other group of net importers (including New Zealand) numbers 152 countries, 62 of which (again including New Zealand) have some domestic production, but not enough to cover their needs. So we have three groups of players in the game. The first are the net exporters, the second group are the net importers who have managed to secure some decent supply agreements with the exporters, and the third is The Rest (including New Zealand) who are reliant on supplies from the net exporters, but who have no significant assurance of supply from anybody. What then does the future hold for us? World Energy Outlook 2010 and subsequent reports and refinements, gives a transparent view of the future oil supply situation for places like New Zealand. The key chart is shown below in Figure 1. 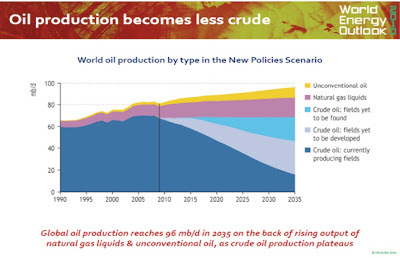 The WEO 2010’s chart for the New policies scenario gives their best estimate for World Oil Production from Currently producing fields, Fields yet to be developed, Fields yet to be found, Natural gas liquids, Unconventional oil. 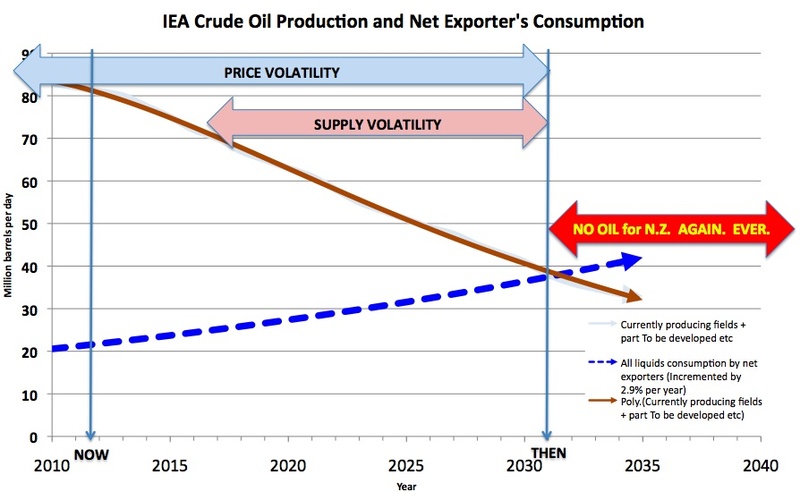 I end up putting a pin in the IEA chart at about 40 million barrels a day around 2030. I find any higher figure to be non-credible. So in terms of the raw production likely going forwards we have the production curve for existing fields, and a sliver of the production from the rest. 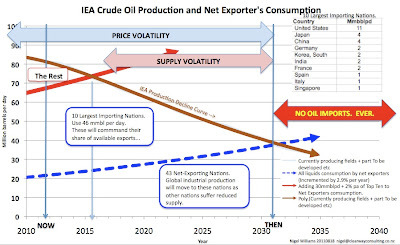 Figure 2 shows this decline curve through 40 million barrels a day around 2030 and the demand curve of the exporting nations incremented upwards by 2.9% per year. This modest increment rate recognises the impact of the overall declining global economic situation, and the increased internal demand arising from natural growth exacerbated by transfers of production from other countries. 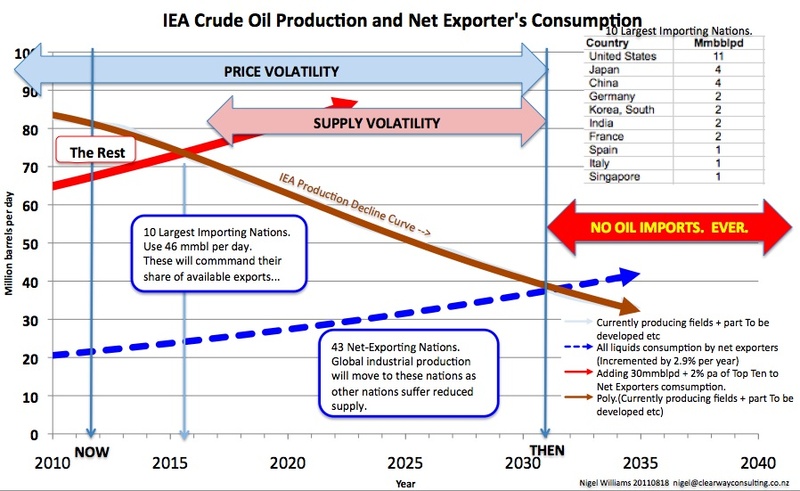 Based on this simple chart, it appears that there will be no oil left for anybody except exporting nations by about 2031. But don’t worry yet; it gets worse. If we add the demand of those Top Ten net-importing nations which have managed to secure some solid supply agreements to the exporter’s demand then we get a better idea of what is left for The Rest (Figure 3). Figure 3: WEO 2010, Exporters Top Ten and The Rest. The oil supply for The Rest is defined by the declining global production curve and the rising internal demand of exporters and the Top Ten importers. This ‘triangle of hope’ in the top left corner of the chart, terminates (and I use the word advisedly!) in about 2016, five years from today. As the overall system is working today, things seem to be hanging on in some sort of fragile balance, don’t they? The present demand of the 152 importing countries excluding the Top Ten amounts to about 12 million barrels a day, as represented on the Now axis in Figure 3. But that happy situation does not seem likely to continue does it? What can be wrong with this interpretation? 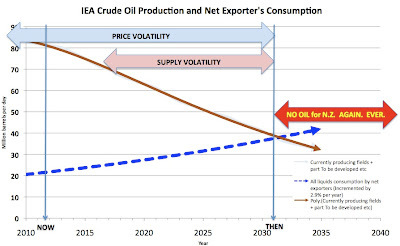 •	The estimate of usable crude oil production could be too low? That has the effect of giving us more time. •	The estimate of the growth in internal demand of the oil exporting nations could be too high. Giving us more time. •	The estimate of growth in demand of the Top Ten oil importing countries, and the persistence of their demand could be too high. Giving us more time. •	Every indication I find confirms that there is a widening gap between discoveries and production. •	Much new oil production requires sustained oil prices that the world economy cannot afford to pay, so the oil will remain in the ground. •	Oil exporting nations will be the last bastion of conventional manufacturing and production. This will not go un-noticed. •	The momentum of the Top Ten importers (including China and India with growth of around 8% to 10% expected) will place immense stress on their oil supply lines. They will not go quietly. •	New Zealand has no political or practical infrastructure in place to take over oil supply arrangements from its present corporate providers, or to negotiate supply agreements with any producer. We are voiceless in the market. Thus there are reasons for each curve to be steeper or flatter, for the end-point to come sooner or later. But this extension of the Export Land model to include the demands of the most powerful importers as well shows the frightening vulnerability of the smaller oil importing nations. It is not just a matter of looking at the end of all oil exports on some far-distant date, but rather this analysis reveals that oil supplies may end for New Zealand and over 150 other small-importer nations very much sooner. The transfer of the power represented by energy-wealth will, as the Export Land Model suggests, be surprisingly rapid. Smaller nations like New Zealand are virtually powerless to control their energy supplies, and in particular to claim a viable share of the declining resources. The potential pace of this change in supply conditions is not well understood by decision makers, and even less accepted by New Zealand’s political leadership. Regardless of the actual date of the end of our oil supply the risk of abrupt and sustained failure of most of New Zealand’s oil supply is acute, and immediate. Sounds like we are powerless as well as voiceless. I wonder which street we should take? Acceptance is the first stage and most people are totally unprepared to do that. However Nigel is making his own preparations and that's the least we can all do. Also influence policy makers as much as we can. Again Nigel is in a good position to do that. The best scenario is to take a Transition Town approach and have an oil descent plan. It really isn't entirely hopeless, like everything we can choose to make the best of it. I think that once the fact that most of our 'leaders' are sociopaths, interested only in themselves, it gets easier. Since I have no expectations of the political process, I am not disappointed. One needs to by-pass conventional politics altogether and adapt by working in small groups in which psychopath has no place - nor no desire to be. This is a very thorough piece of research. No politician here would dare to contemplate it. Toss in the exaggerated ME reserves and its game on. Very interesting discussion! As a US citizen, I've mostly paid attention to how soon will our giant oil imports be reduced, & how fast. Never before considered how soon the 150 smaller economies would "cross the line" of what's left from the Export Land model. the above article makes the common mistake of confusing reserves with production. No one is denying that there is a lot of oil out there. The problem is the RATE at which it can be produced.... flatlining since 2005. And fails to take account of the fact that all the easy cheap oil has gone and the stuff that remains is hard and very expensive to extract, with a decreasing energy return on energy invested. Your source talks about the fact large reserves remain, no-one’s arguing with that, the issue is economically-fisable extraction rate. It’s slightly worrying that you don’t understand that peak oil is about production rate, not reserves – it’s like how your car is limited by (inter alia) the amount of fuel the engine can get from the petrol tank at any one time, not the amount that’s in the petrol tank. Doom and gloom about NZ oil reserves might be premature. Overall NZ is under-explored especially offshore. NZ has abundant coal reserves esp lignite that can be converted to liquid fuel. Shale gas exploration is underway with some success. There are also some known on-shore oil shale deposits though the volumes are not huge. Anyway its not time to turn the lights out yet. Forgive me Denis, but I really enjoy watching you work. Even IF oil is discovered here in useful quantities that can be developed for the going price, then it is very unlikely that it will be brought ashore in 44 gallon drums tied to the outrigger of a waka and distributed locally for the benefit of we the citizens of Aotearoa. Add in a bit of climate change and dwindling middle eastern water supplies, one item in our interim favour could be (double?) bladders inside the oil tankers so that we could trade oil for our excesses of clean water. The tankers off-load oil at Marsden Point then head to Fiordland to fill up with water from the Manapouri tail race / tunnel. Part of the domestic increase in oil in the middle east is to power their increasingly large desalination plants. But let's start today with mass electrification of our transport; buses, rail freight & commuter, etc and reinforcing our national grid before (embodied energy) construction projects escalate in line with increasing oil prices. So much wishful thinking. I believe as many observers do that our lives over the next 20 years are going to be nothing like the lives we've lived the past 20 years. We need to get reconciled with the reality of a future without cheap oil. For starters, we will not have access to the transportation infrastructure that cheap oil provided us nor any of the products it now delivers to us. New ideas are great, but most require either a change in public behaviour, or 10 to 20 years to implement neither of which we have - we won't even have the capital to get the big-ticket items started. But Russell B. your bike and vege garden put you streets ahead of your fellow citizens who would rather live in denial.